The Akan region, an area on the coast of West Africa’s Gulf of Guinea, lies between the Bandama River in IVORY COAST and the Volta River in GHANA. During the 1600s, separate, competing states were formed in the northern and southern parts of the region. Before the 1400s, the region consisted of small communities of Akan clans. These people lived in relative isolation until traders from the north arrived, attracted by the gold and kola nuts to be found in the Black Volta River region and the Akan forest. This new trade led some Akan people to move north and eventually to found several important states and trading towns. Europeans arrived on Ghana’s coast in the late 1400s, stimulating trade in gold and slaves. The Portuguese arrived first, and were followed by the French, English, and Dutch in the sixteenth century. Later, the Danes, Swedes, and Brandenburgers (traders on the Gold Coast from the Brandenburg Africa Company) arrived in the seventeenth century. 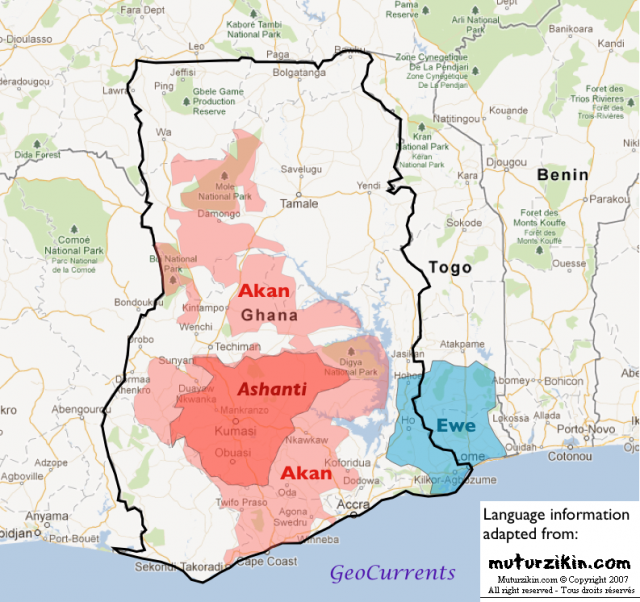 Some Akan clans moved south to the coast, where they established a loose confederation known as the Fante states. These states competed for trade with the northern Akan clans. In the 1600s several different Akan states tried to gain control of the region. The most powerful to emerge were the Denkyira, who conquered a large portion of the southern and western Akan region. In the late 1600s a group of northern Akan chiefs formed the ASANTE state. Over the years, the Asante took over territories in the region and established an empire. They expanded their trading routes and became an important source of slaves for the slave trade. In 1807 the Asante attacked the Fante, and warfare between the two peoples continued for 11 years. This conflict brought the Asante into contact with the British, who had traded with the Fante for many years. Opposed to the Asante’s slave trade, the British sided with their longtime trading partners. In 1824 the British and the Fante attacked the Asante but were badly defeated. The allies had more success two years later, and the conflict was settled in 1831 by a treaty that recognized the independence of the Fante states. To enforce the treaty, Britain expanded its political and economic presence in the area.